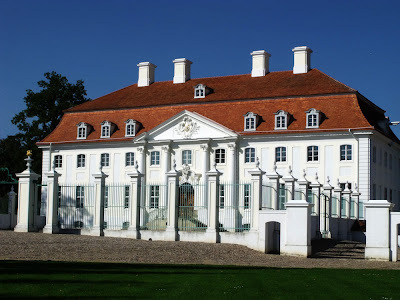 On a cycle from Gransee to Neuruppin we came across a small, immaculately kept village attached to a large, bright white, Baroque château about 70km north of Berlin. 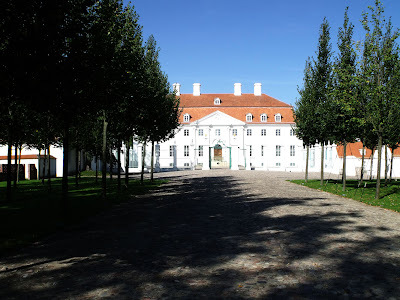 This is Schloss Meseberg, built in 1739 by the old Prussic noble family of Wartensleben. It came as something of a surprise after the long bike-ride through thick forests from Gransee, and gave us another surprise when we found out what its use is today. Entrance driveway to Schloss Meseburg, Brandeburg. 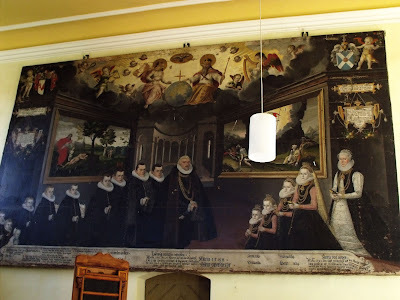 In the small but ancient church there is an enormous painting from 1588 showing Ludwig von der Gröben, his wife (born Anna von Oppen), along with their seventeen children (13 boys and 4 girls). Family portrait of the Von der Gröben's at prayer in Meseberg church. 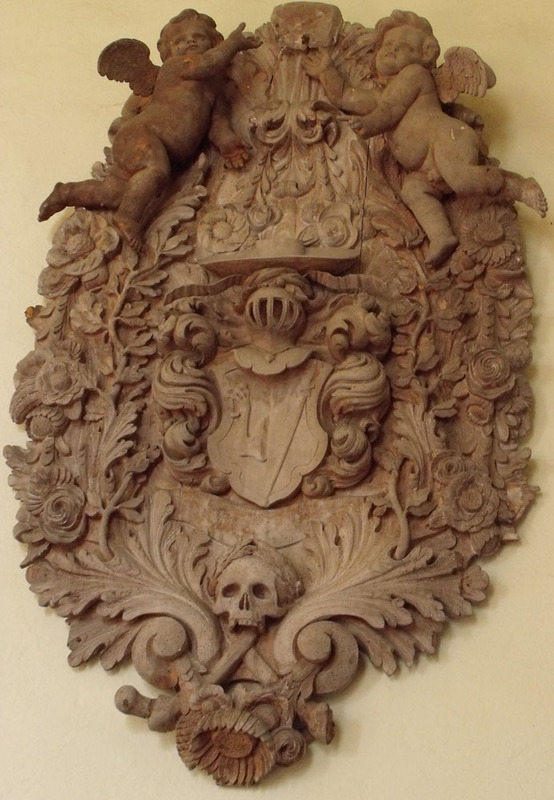 There are also gravestones and memorials in the nave to other notable von der Gröben's. You can tell them by the eagle's claw on the left of the shield. They were part of the nobility of Mark Brandenburg, and later Prussia and the German Empire, and indeed their descendants are amongst us today. Rather than generals or diplomats though, they are e.g. sports commentators and soap stars. Their connection to Schloss Meseberg is that the count Wartensleben who built it had gained the manor by marrying Dorothea von der Gröben who was heiress to this little packet of land. Monument to one of the Von Gröben's. I come to know this because the Schloss and its history was written down by Theodor Fontane in his 19th century blockbuster travelogue 'Wanderungen durch die Mark Brandenburg' ('Rambling through Mark Brandenburg'). 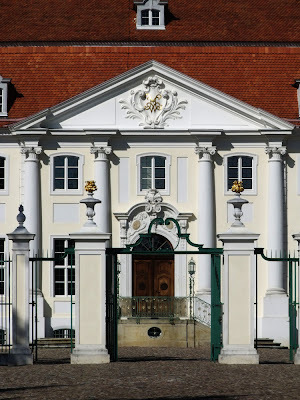 Fontane also describes the Schloss as being 'Wie ein Zauberschloß' - trans: 'like a magic castle'. The Schloss was later owned by the family Lessing, founders of the Vossiche Zeitung, one of the first Berliner newspapers in the eighteenth century and a liberal publication at the forefront of the German Enlightenment. Indeed, the family included the important Enlightenment poet Gotthold Ephraim Lessing. After 1945 the Schloss was seized by the DDR and put to use to house, amongst other things, a kindergarten, a grocers, and the mayor's office. After Germany's reunification the by now rather run-down and dilapidated ruins were bought by the Messerschmitt Foundation (yes, that Messerchnmitt. The one who designed and built the fighter planes) and restored at a cost of 25 million €. 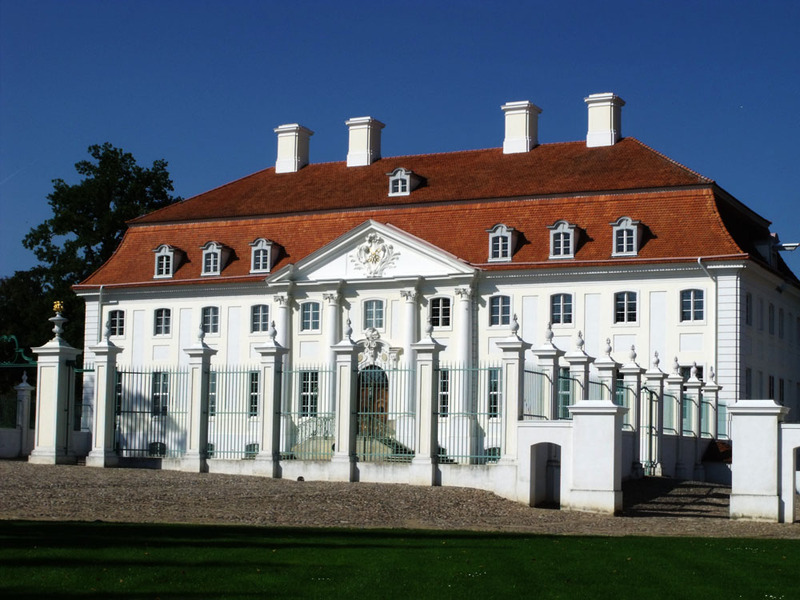 Since 2004 the Schloss has been leased out by the Messerschmitt Foundation to the Federal German Government at a peppercorn rent of 1€ per year over 20 years. The Government has since been using it as a guest house for important international visitors - its first guest was French President Jacques Chirac on 26th Jan 2007 - but there didn't seemed to be anyone staying when we were there. The Schloss and its landscaped gardens are set beside the small, serpentine Huwenowsee sitting in a picturesque ravine. 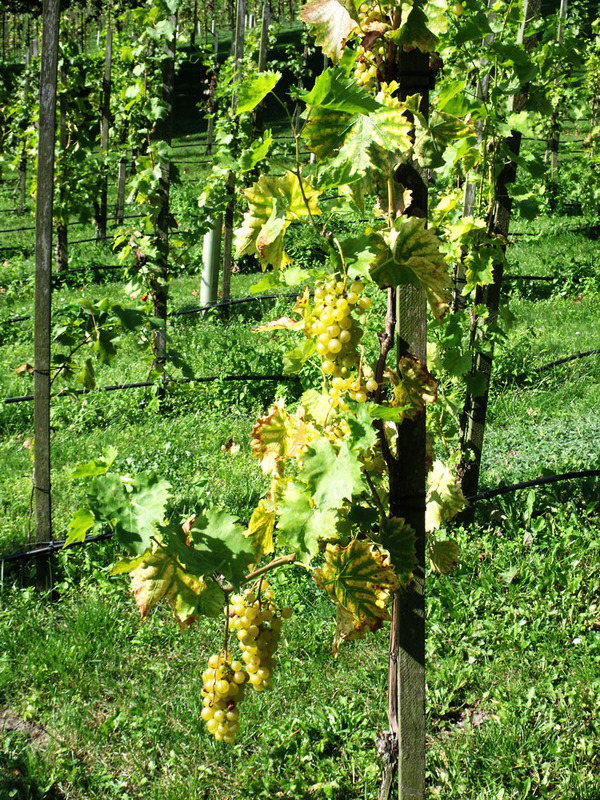 The slopes from the road down to the lake are terraced with grapevines. 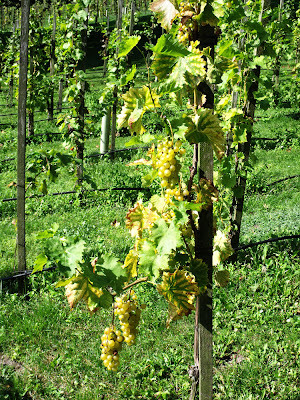 Delicious though they looked, we didn't lean over and pick a handful of Angela Merkel's grapes though. I don't think she would have been too pleased, and you can be sure the entire grounds are peppered with security cameras. Thanks for the look at a piece of German history. Such a grand structure. Thanks for the latest info on Schloss Meseberg. I am a descendant of the brother of Gotthold Ephraim Lessing, and I visited the Schloss in 2000 when it was just beginning to be renovated. A large group of Lessing descendants visited at that time, indeed, one had been born in the small cottages nearby. It is wonderful to see the Schloss restored. Hi, my maiden name is Meseberg. So this Meseberg Castle was in the Soviet part of Germany?